The Indonesian government yesterday signed a final and binding agreement to acquire a majority stake in one of the world’s largest gold and copper mines in Papua province. Indonesia is striving to enhance trade with Cambodia by encouraging local businessmen to take part in a business meeting held in Phnom Penh on Thursday as part of efforts to penetrate the Cambodian market. Zurich Insurance is acquiring an 80 percent stake in Indonesia’sAdira Insurance from PT Bank Danamon Indonesia and a minority investor for around $414 million, the Swiss group said on Thursday. State-owned energy holding company Pertamina’s oil imports stood at an average of 393,000 barrel per day (bpd) up to August, 6 percent higher than in the entire year of 2017, when it imported 370,000 bpd on average. Tourism Ministry Arief Yahya has stressed the importance of better accessibility to tourist destinations while also highlighting the remaining A-factors in tourism, namely attractions and amenities. Indonesia’s imports of wheat for flour are expected to reach 8.5 million tonnes this year, an industry body said, up from 8 million tonnes in 2017, despite increasing prices of the grain. Indonesia’s central bank raised its key interest rate for the fifth time in six meetings, wary of the potential for further currency depreciation after the U.S. Federal Reserve raised its benchmark rate for the third time this year. OCBC Bank is ramping up its digitalisation efforts in Indonesia in a bid to capture a larger share of the market. In Indonesia’s conservative province of Aceh, a long-awaited promise to stop caning criminals in public places lasted only a few months. A rights group says the Indonesian woman imprisoned for blasphemy after complaining about noise from a mosque is sharing a cramped cell with 16 other women and given “terrible” food. Indonesia’s rupiah dropped on Thursday (Sep 27) to its lowest level against the Singapore dollar since at least 1992, even as the government in Jakarta took measures to protect the embattled currency. Indonesia is dependent on its oceans in a way few countries are. The densely populated archipelago nation of over 10,000 islands is home to some of the world’s most productive and threatened fisheries, providing about 15 percent of the country’s gross domestic product and an even larger portion of jobs. Indonesia is to keep export taxes for cocoa bean shipments in the month of October at 5 percent, while leaving crude palm oil exports untaxed, the Trade Ministry said on Thursday, unchanged from this month. Indonesia’s biodiesel production could rise to 7 million tonnes in 2019, up 40 percent from an estimated 5 million tonnes this year, due to a new programme to boost local biodiesel consumption, said an Indonesian ministry official on Thursday. Indonesia’s central bank plans to issue regulatory measures that will permit banks in the country to trade non-deliverable forwards in the domestic currency market. Now Indonesia can import corn and soybeans from Russia. Indonesian Ministry of Agriculture informed Rosselkhoznadzor about this. Despite running late in eradicating filariasis, the government says it will rid the country of the tropical disease by 2025. Indonesia is close to finalising incentives for exporters holding billions of US dollars in banks to encourage them to convert the funds into rupiah, as the central bank steps up efforts to shield the local currency from a global emerging market rout. The Indonesia Ministry of Agriculture continues to improve the quality and quantity of the nation’s orange fruit production. The growth of e-commerce is set to increase sales of fast-moving consumer goods across the globe, according to a new report by Nielsen Company released earlier this week, but Indonesia must increase investment in internet infrastructure to seize the potential. Indonesia urged the United Nations Human Rights Council on Monday (24/09) to take “real actions” and put an end to Israel’s impunity. 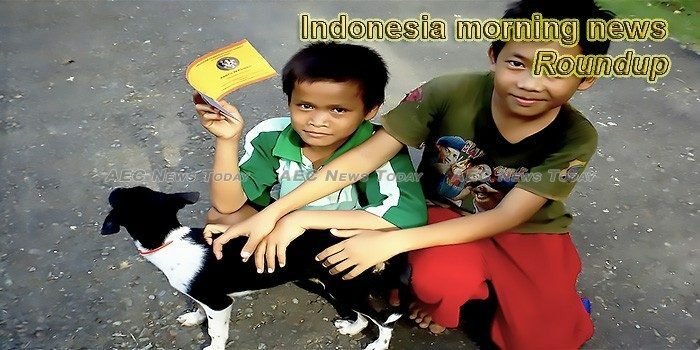 This week’s Indonesia morning news feature photo acknowledges World Rabies Day, September 28.